Following the Allied breakout from the Normandy beachhead in July 1944, the vaunted German Army seemed on the verge of collapse. As British and US forces fanned out across northwestern France, enemy resistance unexpectedly dissolved into a headlong retreat to the German and Belgian borders. In early September an elated Allied High Command had every expectation of continuing their momentum to cripple the enemy's warmaking capability, by capturing the Ruhr industrial complex and plunging into the heart of Germany. After a brief pause to allow for resupply, Courtney Hodge's First Army prepared to punch through the ominous but largely outdated Westwall (Siegfried Line) surrounding Aachen. During the lull in combat operations, however, German commanders such as the "lion of defense," Walter Model, continued to reorganize depleted units and mount an increasingly potent defense. Although the German Replacement Army funneled considerable numbers to the front, they all too often strained an overburdened supply system and did not greatly enhance existing combat formations. More important was that the panzer divisions, once thought irretrievably destroyed, were resupplied and reinvigorated. When the Allied offensive resumed it ran into a veritable brick wall—gains measured in yards, not miles, if any were made at all. While combatants from both sides suffered equally in an urbanized environment of pillbox-infested hills, impenetrable forests, and freezing rain, the Germans were on the defensive and better able to inflict casualties out of proportion to their own. For the US First Army, what was originally to be a walk-through turned into a frustrating six-month campaign that decimated infantry and tank forces alike. The “Broad Front,” as opposed to a “Schwerpunkt” strategy, resulted in the demise of many a citizen-soldier. 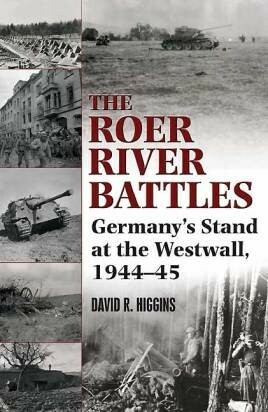 Drawing on primary Wehrmacht and US sources, including battle analysis and daily situation and after-action reports, The Roer River Battles provides insight into the desperate German efforts to keep a conquering enemy at the borders of their homeland. Tactical maps down to battalion level help clarify the very fluid nature of the combat. Combined, they serve to explain not just how, but why decisions were made and events unfolded, and how reality often differed from doctrine in one of the longest US campaigns of World War II.